Where seen? 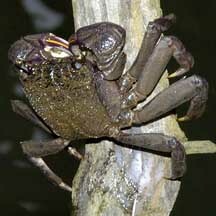 These crabs with flat, squarish bodies and flat pointed legs are common in many of our mangroves. 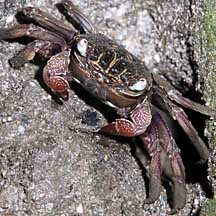 Our mangrove trees are often full of crabs! Features: Body width 4-5cm. Body flat and squarish, legs flat with pointed tips. Pincers may be colourful. The sides of the body have a structure with a net-like pattern that help recirculate and oxygenate water in the gill chambers. In this way, these crabs can breathe air and stay out of the water for some time. 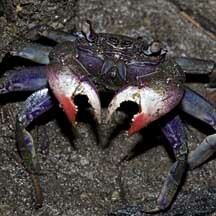 Many are burrowers, digging holes at the base of mangrove trees and in mud lobster mounds. At high tide during the day, tree-climbing varieties are often seen clinging to tree trunks just above the water line. Here they remain motionless. They probably do this to avoid both aquatic predators in the water, as well as airborne predators such as birds. 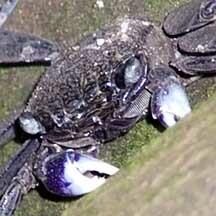 Some of the Episesarma species seen in Singapore can be distinguished by the colour of their pincers. What does it eat? It eats mainly leaves, gathering these at night from the ground or by climbing up trees. 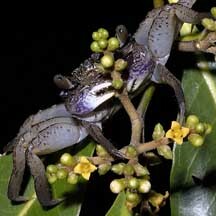 These crabs have been observed as high as 6m up in trees. It may also scavenge any dead animals that it comes across. Human uses: The Teochew pickle these crabs in black sauce with vinegar and eat them with porridge. The Thais eat them salted with the roe or fried whole. They are considered pests in mangrove plantations because they attack mangrove seedlings. About to munch on flowers? ^Lee B. Y., Ng N. K. & P. K. L. Ng. The taxonomy of five species of Episesarma De Man, 1895 in Singapore (Crustacea: Decapoda: Brachyura: Sesarmidae). 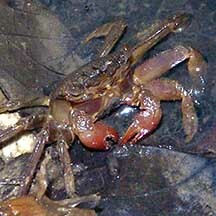 Sesarmine crabs, Tree-climbing/Vinegar crabs (Episesarma spp.) Ng, Peter K. L. & N. Sivasothi, 1999. A Guide to the Mangroves of Singapore II (Animal Diversity). Singapore Science Centre. 168 pp. Sesarmine crabs (Episesarma and Chiromantes) Tan, Leo W. H. & Ng, Peter K. L., 1988. A Guide to Seashore Life. The Singapore Science Centre, Singapore. 160 pp. Episesarma singaporense (Decapoda :Grapsidae) [[#|Singapore]] vinegar crab by Zeng Yiwen, 2011 on taxo4254. Lee B. Y., Ng N. K. & P. K. L. Ng. The taxonomy of five species of Episesarma De Man, 1895 in Singapore (Crustacea: Decapoda: Brachyura: Sesarmidae). 10 July 2015. The Comprehensive Marine Biodiversity Survey: Johor Straits International Workshop (2012) The Raffles Bulletin of Zoology 2015 Supplement No. 31, Pp. 199-215. FREE photos from wildsingapore tagged with Sesarmidae. Make your own badge here.